(CBS News) Since arriving in London as the leader of the American delegation to the 2012 Olympics, first lady Michelle Obama has chatted with Prince William and Kate, Duchess of Cambridge, hugged soccer star David Beckham , given a pep talk to American athletes and joined some children for a "Let's Move" tug-of-war. According to a report in The Daily Mail, Mrs. Obama, dressed in red, white and blue, cheered the American Olympians at a Friday breakfast near Olympic Park. She told them how the games always inspired her father after multiple sclerosis kept him from his old athletic pursuits. She also urged them : "Try to have fun. Try to breathe a little bit." 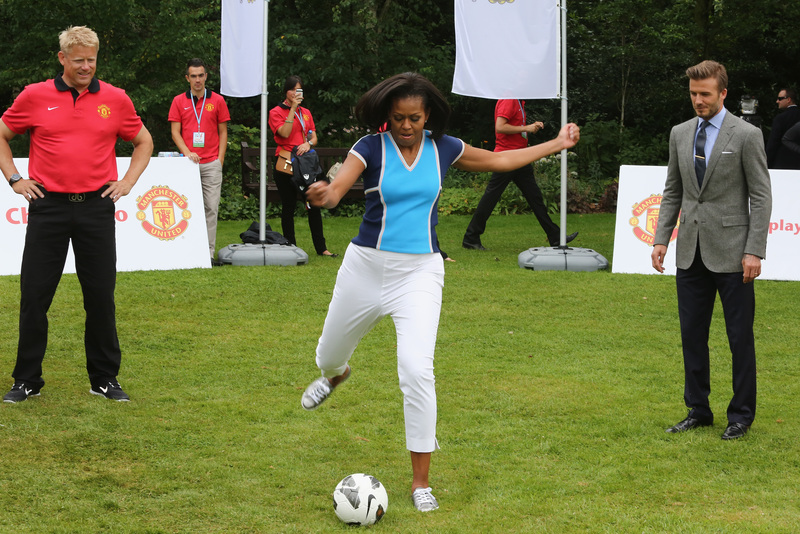 Later that morning, Mrs. Obama shared a stage with Beckham, the British soccer star who plays for the Los Angeles Galaxy, on the lawn of Winfield House, the home of the U.S. ambassador. The two joined other athletes and some 1,000 children in a variety of sports. Many of the youngsters were from military families based in Britain or underprivileged London neighborhoods. The event was part of the first lady's "Let's Move!" campaign, aimed at conquering childhood obesity by promoting sports. In the afternoon, Mrs. Obama donned a soft, pleated white skirt and printed top to attend a reception for visiting heads of state at Buckingham Palace. She was accompanied by the U.S. ambassador to the U.K. It was there that she chatted not only with the queen but with Princes William and Harry and Kate, the Duchess of Cambridge. Then it was on to Olympic park and the opening ceremonies. On Saturday, the first lady is to meet with Samantha Cameron, wife of British Prime David Cameron, and attend Olympic events. She is to return to the U.S. on Sunday.